TORONTO, ON – August 1st, 2018 – The Toyota 86 is the authentic sports coupe – packing a spirited Flat 4 Boxer engine, rear wheel drive plus incredible balance and handling to make every drive feel like a day at the track, all in a stylish package that’s loaded with features. And for 2019, Toyota Canada is offering the 86 in a TRD Special Edition that injects more aggressive performance and style. The Toyota 86 is offered with a choice of six-speed transmissions. With the manual gearbox, the engine delivers a peak 205 horsepower and 156 lb-ft of torque, and the driver enjoys precise shifts with a short throw. With the automatic transmission, peak horsepower and torque figures are 200 and 151, respectively, with the driver experiencing aggressive upshifts and sporty rev-matched downshifts, initiated by steering wheel mounted paddle shifters. Coupes are about more than sporty performers – they’re also beautiful machines. 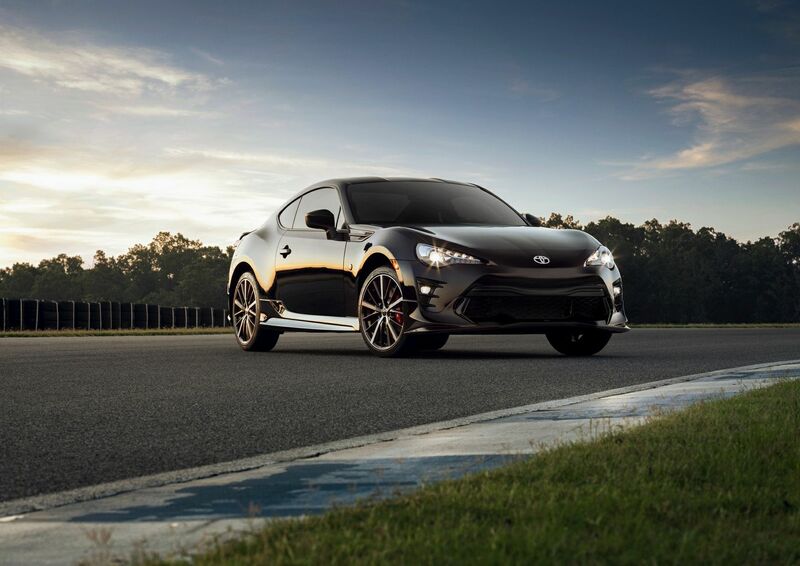 The 86 presents its performance credentials through bold, aggressive styling. The 86’s Boxer engine – with its horizontally-opposed cylinders – is compact and flat, set further back in the chassis to enable a lower, more aggressive front hood. The vehicle’s low stance is enhanced by a powerful front end featuring sharp lines, a wide grille and angular LED headlights. The roofline contributes to its low, sleek profile and aggressive curbside manner. More than just good looking, the body is built from highly rigid yet lightweight components, aluminum hood, and resin fuel tank – all with the goal of keeping the total vehicle weight under 1,300 kg for an agile and responsive driving experience. The 2018 Toyota 86 also provides driver and passengers with the benefits of state of the art safety technologies, including the Toyota Star Safety System, six airbags, LED headlamps featuring the automatic headlamp system plus a high-mount LED stop lamp, a tire pressure monitoring system, back-up camera, and more. The 2019 Toyota 86 is a track-tested and proven model offered with either the manual (Starting MSRP: $29,990) or automatic (Starting MSRP: $31,190) transmission. This model features 17” alloy wheels, and driver-focussed instrumentation including a multi-information display and digital/analogue speedometer. An eight-speaker 7” Display Audio system with USB input, Bluetooth connectivity and steering wheel-mounted controls provides the soundtrack, while an impressive list of comfort and convenience amenities include auto air conditioning, variable intermittent wipers, dual power-adjustable and heated mirrors, and more. The 2019 Toyota 86 GT is offered with either the manual (Starting MSRP: $33,260) or automatic (Starting MSRP: $34,460) transmission. Upgrades include dual zone automatic air conditioning, seats enhanced with suede-like inserts and leather side bolstering, a 4.2” multi-information display, the Smart Key System with Push Button Start, an anti-theft system, rear spoiler and LED fog lamps. New for this year and available in limited quantities, the 2019 Toyota 86 TRD Special Edition (Starting MSRP: $38,220) is built off the manual transmission GT trim level. It sports Brembo brakes, SACHS Dampers, a TRD performance dual exhaust and aero kit, plus unique 18” alloy wheels clad in P215/40 R18 Michelin Pilot Sport 4 tires. This edition’s more aggressive performance is highlighted by unique styling cues too – including a red-stitched interior with red seat belts plus TRD interior trim and badges, and an exclusive “Raven” black body colour. Production will be limited to only 50 units in Canada. The 2019 Toyota 86 is now on sale at Toyota Dealers across Canada. For complete and up to date details and specifications, visit www.toyota.ca/86.